AmFunds Management Bhd (AmInvest) took home two awards at The Edge-Thomson Reuters Lipper Fund Awards 2018. This is the fifth consecutive year that its AmDynamic Bond fund has won an award. This time, it clinched the award for Best Bond MYR (Provident) in the 10-year category. 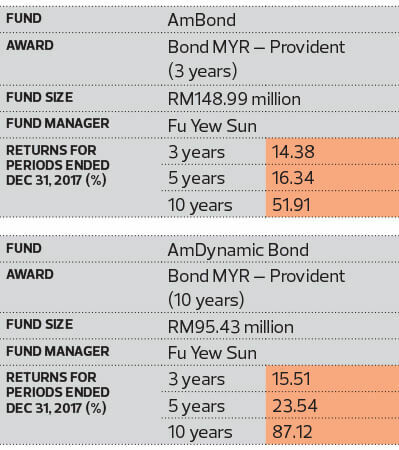 The AmBond fund snagged the award for Best Bond MYR in the three-year category. She adds that its sound investment philosophy and process played a vital role. The fund house’s investment philosophy is guided by a three-pronged process of having a directional view based on macro top-down analysis, bottom-up credit selection that takes into consideration relative value and volatility management via short-term trading. “Our stringent credit processes practised by our proprietary credit research unit is also a significant value contributor,” she says. Goh says the fear of a global growth slowdown was challenging at the beginning of last year. However, the fear gradually subsided as the major economic indicators picked up. Its pace led to risk-taking in emerging markets. Given the strength of the emerging markets in 2017, AmInvest stayed highly invested throughout the year as it believed local and regional bonds would perform well in this market dynamics, says Goh. Now, moving into a rising interest rate environment, the fund will rebalance its portfolio to seek a yield buffer via higher-yielding corporate bonds with sound credit and lower duration risk. According to AmInvest, its assets under management (AUM) — comprising unit trust funds and institutional mandates — have remained stable despite some investors redeeming their investments, mainly due to the regulatory changes in their wholesale money market funds. Its funds under the Private Retirement Scheme saw encouraging growth of 53% for the year ended Dec 31, 2017. The AUM of its Islamic funds, meanwhile, experienced annualised growth of 13% for the five years ended Dec 31, 2017. Goh says developed market bonds will underperform in the rising interest rate environment this year. However, higher-yielding emerging market bonds, such as Malaysian bonds, should remain largely stable, thanks to the higher-yield buffer and strong structural characteristics such as being largely held by long-term institutional investors. “Hence, for AmDynamic Bond, we will largely be positioned ‘closer to home’ and tactically take advantage of the market weakness globally to trade foreign bonds,” she says. Goh says that for now, AmInvest favours sectors driven by reflationary trends such as financial and materials. She also likes the technology sector for its secular growth prospects. She believes that the consumer sector will continue to perform as the economy improves.